Smart city is something of a catch-all buzzword. But, in some ways, it’s the ultimate application of the Internet of Things. A smart city requires ultra-dense network connectivity in support of a range of sensors—public safety, environmental quality, traffic monitoring, etc…—that all feed data into integrated, openly-accessible analytics engines that virtuously yield increasing levels of insight that can be used to smooth municipal management while improving quality-of-life for urban denizens. By the same token, the smart city movement is an imperative given the massive and long-term influx of people from rural areas into increasingly crowded cities, something the United Nations has identified as a mega-trend. But, with such an ambitious goal, where should civic officials focus their limited supply of capital to have an immediate impact that can also serve as a foundation for future projects? In some cities, limited pilot projects have proven to be just that—one-offs that serve as a showpiece, but don’t create the environment of continued investment and innovation. Following from that, the goal should be targeted investment that comes with a clear path to ROI. With a return on an investment, and potentially new revenue sources, city leaders can continue to invest in IoT. In terms of smart city enablement, Silver Spring Networks has emerged as a major player with a range of product, platform and service offerings that cover smart utilities, traffic management, sustainability and smart lighting. Connected lampposts that can be centrally managed do two things for a city: they cut down on power costs and bolster sustainability goals. But, much more than that, smart lighting can serve as a platform for a wide range of IoT initiatives that, in sum, can create a smart city. Cities install lights where people already are—in commercial districts, major thoroughfares, tourists hot spots and around marquee venues. Lighting infrastructure is already connected to the power grid, and ideally, to a utility fiber network. And light poles are elevated above street level providing an optimal location for small cells, which are seen as a key enabler of everything smart city. To that wireless infrastructure piece, scaling small cell deployments face two major challenges: access to power, backhaul and site acquisition. Second, if you’re a carrier or neutral host provider looking to deploy hundreds or thousands of small cells in a given area, it’s easier to negotiate a batch deal for placement with a city than it is to deal with a range of incumbents that already have wires and equipment hanging off of utility poles. Further, small cell infrastructure providers are already working with lighting providers to integrate the RF equipment into light poles. So, when a city is ready to a replace a couple hundred street lights, they could opt for a pre-integrated solution that adds network density, creates a platform for all kinds of IoT solutions and accommodates a speedy deployment that can start adding value to municipal operations more quickly. LEARN MORE ABOUT LINK LABS SMART CITY SOLUTIONS. 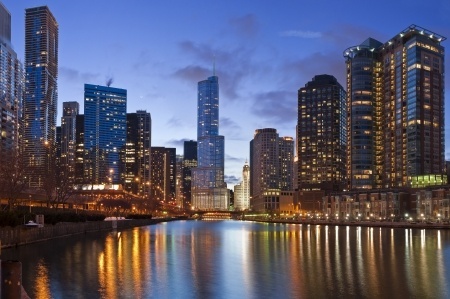 Case in point, the company lent its smart lighting platform to a project undertaken by the city of Chicago to connect some 250,000 light fixtures. The four-year project will update some 85% of municipally-owned light fixtures with LED lights, which are expected to consume 50% to 75% less energy than the existing lighting system. But that’s just the beginning. Note the reference to “future smart city applications.” Louis Maltezos, EVP of project stakeholder Ameresco, said the new lighting “will increase the energy efficiency of the system while helping to improve visibility and safety.” He’s referring to safety as a function of improved lighting—no more dark alleys--but take that a step further. The light poles will be integrated with the city’s 311 system, which provides a portal for access to city services. But what if it were integrated, in the future, to the 911 system? Companies like ShotSpotter have seen good traction for public safety-related IoT solutions like gunshot detecting sensors. You use the lamp post as a host for a sensor that can detect the sound of a gunshot, or person screaming for help, then use the connectivity infrastructure already there to alert police to the precise location of an incident. And cutting down on vehicle emissions and other pollutants. Using the street light as the location, sensors, cameras and other IoT devices can help achieve these goals. Zeto referenced AT&T’s smart cities framework, which the carrier put out in 2016. Building on partnerships with a range of players including Cisco, Deloitte, Ericsson, GE, IBM, Intel and Qualcomm, the goal is use spotlight cities to showcase the real value of a smart city applications covering utilities, street lighting, water systems, infrastructure, citizen engagement, transportation and public safety. And connected light posts can serve as a platform for security cameras, gunshot monitors and other IoT solutions designed to increase public safety. The point is, city’s can invest in street lighting to quickly see ROI based on lower energy costs, while setting the stage for myriad other IoT initiatives that, when put together, turn a city into a smart city.